Does jazz really live at the Lincoln Centre? Is the way of the jazz warrior really from music school to there? Perhaps Whiplash’s original conception described a classical music prodigy, navigating a musical realm wherein the concept of genius is much more wrapped around notions of discipline, perfection and academia. Then someone said that’s too familiar, make it jazz instead. 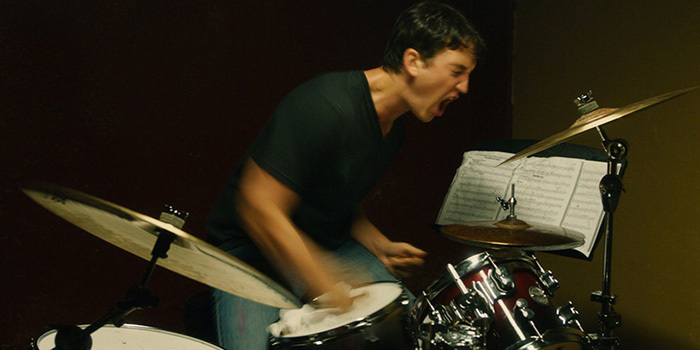 That aside, Whiplash offers an exemplary lesson in narrative structure. It knows exactly where it is going but leaves you in doubt until its final seconds (though possibly it is where you thought you were going in the first place). It builds to a literal crescendo in a rare and luminous fusion of form and content. The only sour note is doubt as to whether its thematic core is true, its central notion born of wisdom or myth. It should be noted that the story told here about Charlie Parker, central to the logic of Whiplash, is inaccurate.